Released under Gurkha's in-house East India Trading Company, the brand's third core-line product is known as Rogue. In true Gurkha fashion, Rogue cigars are designed to stand out in a crowd, with a blazing gold skull front and center on a weathered, white band. Further adding to the mystique, the cigars have been rolled with a closed foot, adding a blast of flavor from first light. But of course the design isn't everything, as this bold smoke has been blended chock-full with ligero tobacco! Yes, underneath the Ecuadorian Habano wrapper and rare (top secret) Ecuadorian binder, lies an intense blend of THREE ligero leafs (Nicaragua, Honduras and Dominican Republic), each aged a full 3 years! 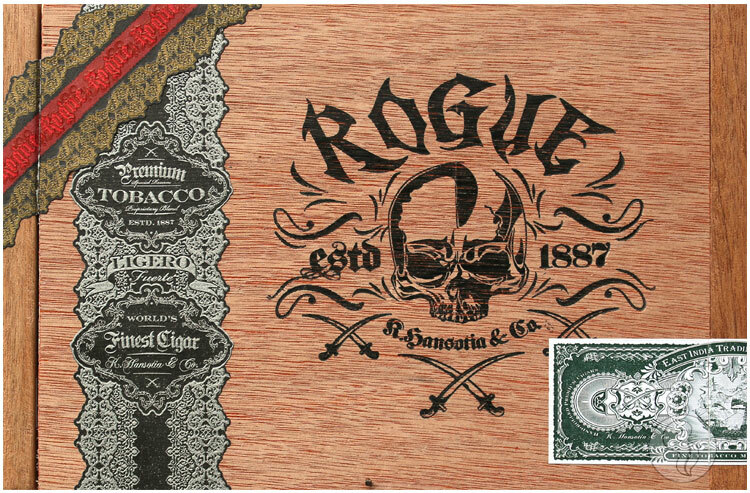 To fully showcase the powerful filler of this cigar, Rogue has been rolled in larger ring gauges and box pressed to allow the blend to meld into a truly enjoyable smoking experience. Expect full flavors of spice, earth, aged tobacco, and a noticeable ligero kick!